For perfect cleanliness in industry, trade, farming and hobby! The Kränzle range of products is subdivided into seven performance categories, i.e. 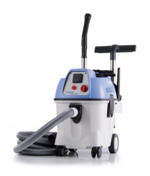 from high-pressure cleaners to industrial vacuum cleaners and hand power sweepers through to the application of specific accessories. Regardless of whether it is a matter of portable high-pressure cleaners, mobile machines, cold water or hot water high-pressure cleaners or stationary machines: the options are almost unlimited. For all our product lines the following motto applies: Better perfect than cheap! Because we attach great importance to the best price/performance ratio, which is documented by the long years of use of our products - designed for everyday situations.